Nancy Reagan’s funeral is today. She will be laid to rest next to the former President of the United States, her beloved husband, Ronald Reagan at the Reagan Library in Simi Valley. 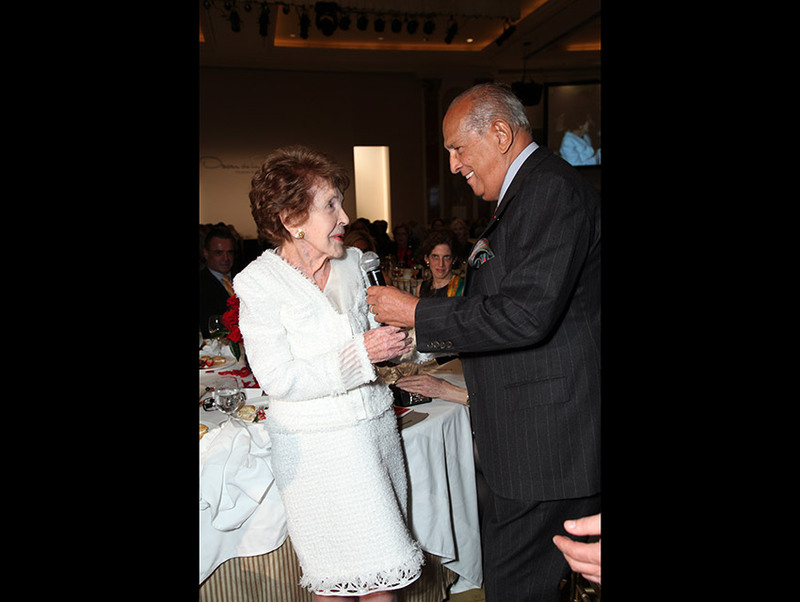 In this photograph, taken by Alex J. Berliner, Reagan and the late Oscar de la Renta share a moment at The Colleagues Luncheon in 2011. Reagan was the guest of honor at this particular luncheon at the Beverly Wilshire and was a Colleague herself. The group was founded in the 1950s and raised money for the Children’s Institute, Inc. The Colleagues Luncheon is the original ladies-who-lunch benefit, and fashion house Oscar de la Renta often stages a show for its members. Reagan wore de la Renta’s designs during her stint as First Lady, and the two were longtime friends. Following the designer’s death in 2014, his successor, Peter Copping, attended the luncheon and staged the show in 2015.